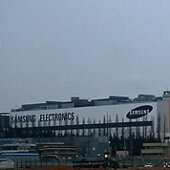 Gas leak at a Samsung plant led to the death of one worker at a factory in Hwaseong, Korea, and four more were injured but later recovered fully at a local hospital. A tank of hydrofluoric acid started leaking gas around 11pm last night with the leaks recurring around 5am. The worker that passed away was an employee of the maintenance company STI that came to fix the leak. What’s also troubling is the fact that there is some possibility that Samsung tried to cover the leak up and hadn’t properly instructed the maintenance company about how serious the leak was. An investigation is underway in Korea, so let’s not jump into conclusions prematurely, but there is slight possibility that the STI worker died because of not being properly equipped to the gas leakage. Hydrofluoric acid is particularly dangerous as burns from the gas could not be initially painful making them hard to notice. The acid is so corrosive that it penetrates tissues quickly doing damage to the nerve system and bones. Samsung has now issued an official comment saying to residents living close nearby that "the possibility of a leak beyond [Samsung property] is zero." I agree but i cannot find out any relation between a "phone" site and an accident of a chemical factory. who told u samsung made only 'PHONE's?? are u new 2 dis universe? Most of the companies newer bother about the workers or environment. They know they can escape from the law using the loop holes. check this link...http://en.wikipedia.org/wiki/Bhopal_disaster I do not think many people get the justice. I think Samsung needs to work on improving their safety standards. I think you need to slip and fall. why do you received red thumb by saying a braviest man to rescue factory? Hopefully they find the leak before more people are hurt :( hope the dead mans family is supported through his death. I work at a facility with HF. It's bad stuff. Only two reds? I thought I was hated more than that. why would someone red you - it sad that someone was hurt. Sounds like there safety standards are about as high as there product qulity! Had this had been Apple...........damn hypocrites.